When Floki got back to Kattegat he can feel his freedom until he got arrested by Bjorn. The arrest follows for the dead of Athelstan. When he gets help to get away from the centre square in Kattegat bullied by children there is a two-part story. One that Bjorn takes away the children and one that Helga defend Floki in front of the children. He got soon arrested again this time by Ubbe one of the children of Ragnar. With his second arrest, he got chained in a cave. Helga who puts a bowl above his head tries to let Floki sleep but when the bowl is full and she is getting tired and tries to fall asleep, Floki wakes and start screaming. After a while when Ragnar ask Helga if she told him Floki wants to know what had happened. When Helga tells him that his daughter passed away, he starts screaming again. We see Ragnar back in the cave with an axe but he frees Floki because Helga doesn't need another burden according to Ragnar. Floki's place in the society is known as outlaw especially when he arrives to celebrate Yol in the great hall. When King Finehair and Halfdan asks why the great boat builder that changed the life of every Viking is in disregard by King Ragnar Floki tells them I killed his Christian pet. Floki went to the Seer who already expected him a long time ago. 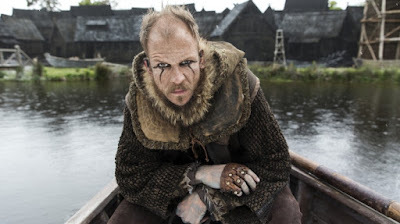 We see a lot of change in the character Floki. especially when Aslaug asks him to teach Ivar about the Viking ways and the gods. Floki is going to sail with King Finehair and Halfdan to Paris. When they set camp the first time there is a part we see him make love to Aslaug. Aslaug at the same time is making love with Harbard. Ragnar asks him a favour and advice when he wants the boats to lift the boats on the mountain and rolled or carried after the towers of Paris. It is great to see that Floki is building great things again. He almost lost Helga because the base camp attacked by Roland. During the second attack of Rollo, he got injured but managed to sail away back to Kattegat. We see him with Bjorn to talk about the imaginary land of the Mediterranean sea. Bjorn and Floki go together with Helga.